Ancestry.com – Use Ancestry Library Edition in any Fresno County Public Library branch for free. It is not yet completely indexed by people's names. In order to locate someone, you need to know his or her address in 1940 and the census enumeration district in which that address was located. Then you browse the census population schedules for that district. Wondering where to find addresses? Try city directories; old family letters, postcards and address books; WWII draft records (available in Ancestry Library Edition); and the 1930 census if the family lived in the same place at that time. 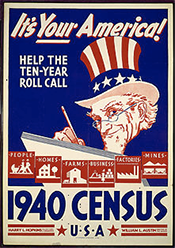 For more help, take the tutorial: How to Access the 1940 Census in One Step. Stephen Morse's site provides three utilities to find Enumeration Districts which go straight to the page in the census. Search for Enumeration District Maps in the National Archives online catalog. In the search box enter: 1940 Census maps + the county + the state. For example "1940 Census maps Fresno California". Warning: these can be very large images. Go here to decipher all the codes used on the 1940 census. Print this form for a quick reference to the column headings. NOTE: Print the form using landscape orientation. For additional assistance with the 1940 Census, contact the Library’s San Joaquin Valley Heritage and Genealogy Center.